Lake Louise...photo taken a few years ago on the way home from the Stampede! I was just looking at my Earth Day post from last year and reviewing the list of things that I had wanted to incorporate into my life. I'm happy to say that I actually followed through and got pretty much most of the list checked off! Yay! Actually, whenever I go shopping in general I usually opt out in getting a plastic bag as my handbag is pretty big that I can fit most items in there. If not, I have the basket of the stroller that I can fill up! I never did buy a bike. That is still on my list of things to do though. I just didn't think it was feasible to get one when I couldn't use it during my pregnancy. Instead I traded the bike idea for a stroller! I also never did start a compost. That's only because my last place already had a compost started up. Our current place does not have a compost, but unfortunately I really don't see myself trying to start one up here. I'm thinking I need to find an alternative solution to this cause I still feel bad at the amount of food we throw away...like all the carrot and potato peelings! Brett LOVES potatoes, so we pretty much eat them every day. We also eat a lot of peppers, zucchini, and broccoli and I swear a quarter of our garbage is the "clippings" and innards of those veggies! I would still like to grow my own herbs. At the last place we didn't need to buy rosemary since the backyard was overflowing with it, but now that we don't have access to the excess bounty of rosemary I find we use that herb all the time! And I honestly have dreams of growing basil. Mmmm...fresh basil for insalata caprese, pizza margherita, homemade pesto...I'm getting hungry! I also just realized that even the hair salon that I go to in Vancouver is environmentally friendly! For those who want to know how a hair salon can a friend to Mother Nature, check out Clover Salon's website here. I have to say, I am most proud of reducing the use of plastic in our household. I think those Brita ads got to me. The ones where a lady is either reading a book in bed or running on a treadmill and you can see her plastic bottle full of water beside her, and the caption is "30 minutes on a treadmill...forever in a landfill". No to mention that the ads on CBC for 1 million acts of green always reminds me to do my part for a healthier planet. My goal since last year's Earth Day has been to cut down on our plastic consumption, and I am so proud of accomplishing this and more! Aside from the random plastic soda bottle here from time to time, we rarely bring plastic shopping bags home. We currently have maybe a fistful of plastic shoppers in our house. Although, with that all said, I do bring home a paper shopping bag from time to time. But that's only if I know I need to wrap a gift in the future. Yes, I like to use cool and interesting paper bags for wrapping paper*. I know there are a few more things I wanted to do, but am having a brain fart at the moment. Oh well! 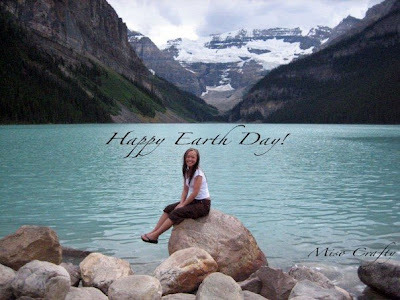 I hope everyone is having a wonderful Earth Day and are planning on doing their part for a greener planet. What are you planning to do? *To make wrapping paper from a paper shopping bag, the kind that has the ribbon/cord/twill handle, I cut along one of the folds of the bag to the bottom. Cut out the bottom so that the bag folds out in one long rectangular piece, and then either gently ripped out or the backing paper that holds the handles to the bag or cut the handles off. Voila! Wrapping paper!